Christopher Francis "Frank" Ocean (born Christopher Edwin Breaux; October 28, 1987), is an American singer, songwriter, and rapper. Known for his idiosyncratic musical style, Ocean first embarked on a career as a ghostwriter, and in 2010 he became a member of hip hop collective Odd Future. He released his breakout mixtape, Nostalgia, Ultra, to critical acclaim in 2011. It generated his first charting single "Novacane". In 2012, Ocean finished in second place in BBC's Sound of 2012 poll. His debut studio album, Channel Orange, was released in July 2012 to critical acclaim and reached No. 2 on the Billboard 200. It was promoted with three singles: "Thinkin Bout You", "Pyramids" and "Sweet Life". In 2016, Ocean released the visual album Endless alongside his second studio album Blonde, following several years of delays. Blonde debuted at number one in the United States and United Kingdom. Ocean was born Christopher Edwin Breaux on October 28, 1987, in Long Beach, California to parents Calvin Edward Cooksey and Katonya Breaux. When he was around five years old, he and his family moved to New Orleans, Louisiana. He grew up around its local jazz scene and listened to his mother's CDs on her car stereo, including albums by Celine Dion, Anita Baker, and The Phantom of the Opera soundtrack. As a teenager, he did neighborhood chores and saved up money to rent studio time. As he recalled, "Oh man I had numerous hustles ... Washing cars was one of them, and mowing lawns and walking dogs." He enrolled in the University of New Orleans and moved into its dormitory in 2005. Shortly after he enrolled in the university, Hurricane Katrina hit New Orleans and he transferred to the University of Louisiana at Lafayette. On February 18, 2011, Ocean released his first mixtape, Nostalgia, Ultra, to critical acclaim. The mixtape focuses on interpersonal relationships, personal reflection and social commentary. NPR's Andrew Noz said Ocean's songwriting is "smart and subtle...setting him apart from the pack." Rolling Stone magazine's Jonah Weiner wrote that Ocean was a "gifted avant-R&B smoothie". In April 2011, Ocean stated that his relationship with Def Jam strengthened since the release of the mixtape. The mixtape made Ocean widely known and led to his collaborations with rappers Jay Z and Kanye West. Ocean first appeared in Tyler, The Creator's music video for the single "She", from Tyler's second studio album Goblin (2011). His first performance was in collaboration with Odd Future at the 2011 Coachella Valley Music and Arts Festival, where he later joined them for their first tour across the east coast of the United States. On May 19, 2011 Ocean's record label Def Jam announced its plans to re-release Nostalgia, Ultra as an EP. The single 'Novacane' was released to iTunes in May 2011, and the EP originally was set to be released the next month, but was delayed. At midnight Pacific time on August 20, 2016, a music video for a song titled "Nikes" was uploaded to Ocean's Connect page on Apple Music and later to his own website. Also on August 20, Ocean announced pop-up shops in Los Angeles, New York City, Chicago, and London for his magazine, Boys Don't Cry and released his second studio album, and third album overall, Blonde to widespread acclaim. On his birthday in 2010, he changed his name to Christopher Francis Ocean through a legal website. The change was reportedly partly inspired by the 1960 film Ocean's 11. In November 2014, TMZ revealed that the name change has not been legalized. On April 23, 2015, Ocean successfully changed his legal name to Frank Ocean. Ocean wrote an open letter, initially intended for the liner notes on Channel Orange, that preemptively addressed speculation about his attraction in the past to another man. Instead, on July 4, 2012, he published an open letter on his Tumblr blog recounting unrequited feelings he had for another young man when he was 19 years old, citing it as his first true love. He used the blog to thank the man for his influence, and also thanked his mother and other friends, saying "I don't know what happens now, and that's alrite. I don't have any secrets I need kept anymore...I feel like a free man." Numerous celebrities publicly voiced their support for Ocean following his announcement, including Beyoncé and Jay Z. Members of the hip hop industry generally responded positively to the announcement. Tyler, The Creator also tweeted his support for Ocean, along with other members of OFWGKTA. Russell Simmons, a business magnate in the hip hop industry, wrote a congratulatory article in Global Grind saying "Today is a big day for hip-hop. It is a day that will define who we really are. How compassionate will we be? How loving can we be? How inclusive are we? [...] Your decision to go public about your sexual orientation gives hope and light to so many young people still living in fear." 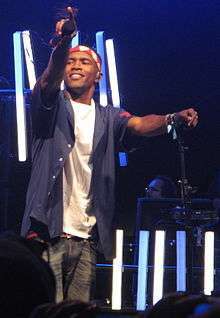 Ocean sampled the music from the Eagles' song "Hotel California" on the song "American Wedding" from Nostalgia, Ultra. When asked about it, Ocean stated that Eagles band member "Don Henley is apparently intimidated by my rendition of 'Hotel California'. He threatened to sue if I perform it again." In response to Ocean's comments, The Eagles legal representative released a statement: "Frank Ocean did not merely 'sample' a portion of the Eagles' 'Hotel California,' he took the whole master track, plus the song's existing melody, and replaced the lyrics with his own. This is not creative, let alone 'intimidating.' It's illegal. For the record, Don Henley has not threatened or instituted any legal action against Frank Ocean, although the Eagles are now considering whether they should." Chris Richards of The Washington Post remarked that "certain boomers don't like [Ocean] as much" as "information-age babies" due to the controversy. On March 7, 2014, Chipotle Mexican Grill sued Ocean to receive the money back they paid him in advance for a commercial that Ocean backed out of due to Ocean having a problem with the material in the advertisement. The advertisement was to feature Ocean singing the song "Pure Imagination", and was to promote sustainable farming. Ocean backed out of the spot when Chipotle refused to remove their logo and name from the advertisement. The lawsuit was dropped on March 20 after Ocean paid the advance back in full. The commercial, titled The Scarecrow, was ultimately released with Fiona Apple performing the song. ↑ Powers, Ann (July 5, 2012). 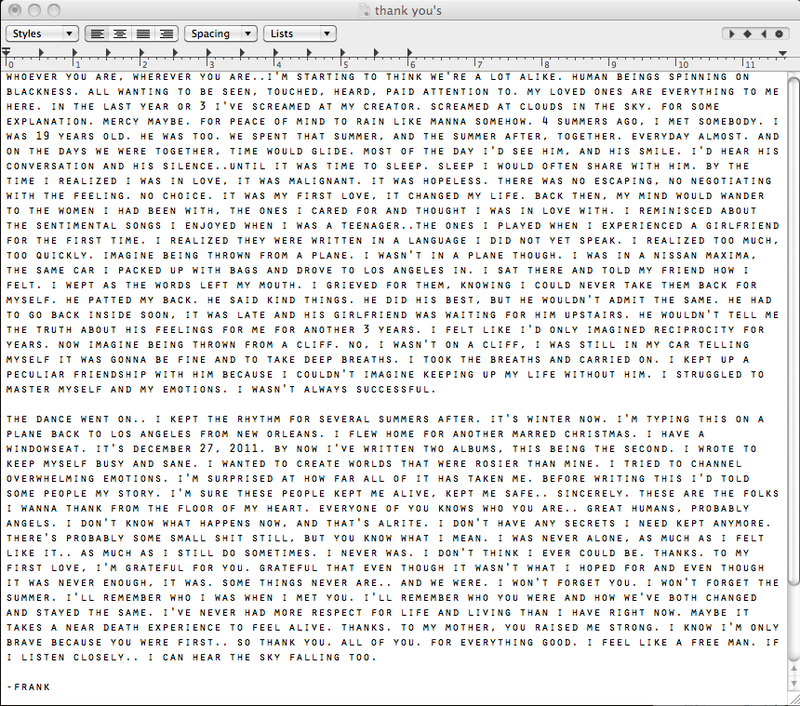 "A Close Look At Frank Ocean's Coming Out Letter". NPR Music. Retrieved July 19, 2013. ↑ "Frank Ocean: R&B Singer and Rapper Reveals His First Love Was a Man | TIME.com". Newsfeed.time.com. 2012-07-05. Retrieved 2014-02-23. ↑ Dionne, Zach (2014-02-12). "Frank Ocean Has a Rap Song for You". Vulture. Retrieved 2014-02-23. ↑ "Frank Ocean Gay? Rapper Talks About Male Lover". Ibtimes.com. 2012-07-04. Retrieved 2014-02-23. ↑ Frank Ocean (2013-06-24). "Frank Ocean Def Jam". Defjam.com. Retrieved 2014-02-23. 1 2 3 "Frank Ocean -- R.I.P. to My Homie ... Christopher Breaux Dies in Court". tmz.com. 1 2 3 4 5 Petridis, Alexis (July 11, 2012). "Frank Ocean: Channel Orange – review". The Guardian. London: Guardian News and Media Limited. section G2, p. 21. Retrieved July 11, 2012. 1 2 Locker, Melissa (July 10, 2012). "Frank Ocean Pours His Heart Out on Channel Orange: Album Review". Time. Time Inc. Retrieved July 11, 2012. 1 2 3 Lipshutz, Jason (July 10, 2012). "Frank Ocean, 'Channel Orange': Track-By-Track Review". Billboard. Prometheus Global Media. Retrieved July 11, 2012. ↑ "Sound of – 2012 – Frank Ocean". BBC. Retrieved April 3, 2012. ↑ Caulfield, Keith. "Frank Ocean's 'Blonde' Bows at No. 1 on Billboard 200 With Third-Largest Debut of 2016". Billboard.com. Retrieved 28 October 2016. 1 2 3 4 5 6 7 8 Jeffries, David. "Frank Ocean Biography". AllMusic.com (Rovi Corporation). Retrieved July 13, 2012. Note: Source gives birthplace as New Orleans. ↑ Staff, TMZ. "Frank Ocean Dad Sues Russell Simmons For $142,000,000". TMZ. Retrieved 14 September 2014. ↑ Exton, Emily. "They Got It From Their Mamas: The 12 Hottest Mothers Of Musicians". VH1. Retrieved 31 October 2013. ↑ "Frank Ocean: BBC News Interview – BBC Sound of 2012". BBC. January 11, 2012. Retrieved July 18, 2012. ↑ "Frank Ocean Attended UL Lafayette In The Fall of 2005, But Somehow No One Really Noticed". Townsquare Media. June 27, 2013. 1 2 3 4 Youngs, Ian (May 1, 2012). "Sound of 2012: Frank Ocean". BBC. BBC Online. Retrieved July 6, 2012. 1 2 3 4 5 6 Baker, Ernest (March 18, 2011). "In His Own Words: Who is Frank Ocean?". Complex Magazine. Retrieved April 28, 2011. ↑ "Frank Ocean in the Studio with Beyoncé". Complex. Retrieved April 28, 2011. ↑ "Beyoncé – 4 (CD, Album) at Discogs". Discogs.com. June 24, 2011. Retrieved August 18, 2011. ↑ "Nas Hits the Studio with Frank Ocean". Rap-Up.com. April 23, 2011. Retrieved April 28, 2011. ↑ Markman, Rob (April 29, 2011). "Nas Calls Odd Future's Frank Ocean 'New, Fresh' – Music, Celebrity, Artist News". MTV. Retrieved May 20, 2011. ↑ Horowitz, Steven (May 2, 2011). "Pharrell in the Studio With OFWGKTA's Frank Ocean". Hip Hop DX. Retrieved May 3, 2011. 1 2 Shepherd, Julianne Escobedo (April 17, 2012). "Frank Ocean Has a Cold". Spin. New York: Spin Media. Retrieved July 14, 2012. ↑ Fennessey, Sean (March 23, 2011). "Love vs. Money: The Weeknd, Frank Ocean, and R&B's Future Shock". The Village Voice. Retrieved April 28, 2011. 1 2 Meatto, Keith (March 15, 2011). "Swimming with Frank Ocean – A review of Nostalgia, ULTRA". FrontPsych.com. Retrieved April 28, 2011. ↑ Noz, Andrew (April 21, 2011). "Frank Ocean: Smart And Subtle R&B Songwriting". NPR. Retrieved April 28, 2011. ↑ Jonah Weiner (April 28, 2011). "The New Wu-Tang Clan: Odd Future | Rolling Stone Music". Rollingstone.com. Retrieved May 7, 2011. ↑ Nadeska Alexis (April 21, 2011). "Odd Future's Frank Ocean Does Not Make R&B – BlackBook". Blackbookmag.com. Retrieved April 28, 2011. 1 2 Johnson, Andrew (December 17, 2012). "Frank Ocean records another first as Channel Orange is named album of the year". The Independent. London. Archived from the original on December 17, 2012. Retrieved December 17, 2012. ↑ "BTS: Tyler The Creator x Frank Ocean – 'She'". The Source. Retrieved April 28, 2011. ↑ "On Set of Tyler, the Creator and Frank Ocean's 'She' Video". Rap-Up.com. October 18, 2010. Retrieved April 28, 2011. 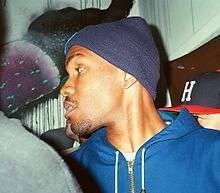 ↑ "Frank Ocean Joining Odd Future For East Coast Tour! | News | Frank Ocean | Artists | Def Jam". Island Def Jam. April 27, 2011. Retrieved May 7, 2011. ↑ "Def Jam To Rerelease Frank Ocean's 'Nostaliga, Ultra'". The Source. Retrieved May 20, 2011. ↑ Danielle Canada. "Frank Ocean To Release "Nostalgia, Ultra" Mixtape in Stores " Hip-Hop Wired: Keeping You Informed With The Latest on Hip-Hop Culture, Rappers, Hip Hop News, Rap and Entertainment News, Black Politics, Video Vixens, Music Reviews and Urban Lifestyle...". Hiphopwired.com. Retrieved May 20, 2011. ↑ "Is nostalgia LITE still dropping 7/26?". July 24, 2011. ↑ Mark Iraheta (June 11, 2011). "Frank Ocean to Work With Kanye West & Jay-Z on "Watch The Throne"". Complex. Retrieved June 11, 2011. ↑ "'Watch the Throne' Production Credits Revealed". Rap-Up.com. July 18, 2011. Retrieved August 18, 2011. ↑ "JAY Z* & Kanye West – Watch The Throne (File, Album) at Discogs". Discogs.com. August 12, 2011. Retrieved August 18, 2011. ↑ "MP3: Bridget Kelly – Thinking About Forever – TheNext2Shine:Exclusive RNB Music Downloads". Blog.thenext2shine.com. Retrieved October 5, 2011. ↑ "'Bridget Kelly – Thinking About Forever". 2DopeBoyz.com. September 15, 2011. Retrieved September 15, 2011. ↑ "Bridget Kelly – Thinking About Forever (Acoustic Video)". 2DopeBoyz.com. September 15, 2011. Retrieved September 15, 2011. ↑ "Frank Ocean – Thinking of You (Video)". 2DopeBoyz.com. September 15, 2011. Retrieved September 15, 2011. ↑ FADER, The (2011-08-09). "World Premiere! The FADER Issue #75: Fall Fashion Featuring Frank Ocean and The Rapture". The FADER. Retrieved November 13, 2013. 1 2 "SINGLE COVER: FRANK OCEAN – 'THINKIN BOUT YOU'". Rap-Up. April 5, 2012. Retrieved April 9, 2012. ↑ "Frank Ocean – Thinking About You". cloudmusiq.com. March 8, 2012. Retrieved March 8, 2012. ↑ Petridis, Alexis (July 11, 2012). "Frank Ocean: Channel Orange – review". The Guardian. London. Retrieved July 19, 2013. 1 2 Caulfield, Keith (July 18, 2012). "Zac Brown Band, Frank Ocean Debut at Nos. 1 & 2 on Billboard 200". Billboard. Los Angeles. Archived from the original on September 14, 2012. Retrieved July 18, 2012. ↑ Hampp, Andrew (September 12, 2014). "Frank Ocean Nabs Three Six Zero's Mark Gillespie as Manager Ahead of New Album". Billboard. New York. Archived from the original on September 15, 2014. Retrieved September 15, 2014. ↑ Frank Ocean's Summer Tour Sold Out BET. July 11, 2012,. ↑ "Frank Ocean Announces You're Not Dead... 2013 Tour". Vibe. May 29, 2013. Retrieved July 19, 2013. ↑ 07/30/2013 11:22 am EDT (2013-07-30). "Frank Ocean Cancels OVO Fest, Osheaga Dates Due To Vocal Cord Injury". Huffingtonpost.ca. Retrieved 2014-02-23. ↑ "Frank Ocean Is on John Mayer's New Album | News". Pitchfork. 2013-08-08. Retrieved 2014-02-23. ↑ "Frank Ocean's Next Album Is On Its Way!". PerezHilton.com. 2013-02-21. Retrieved 2013-06-16. ↑ "Frank Ocean Channeling Beatles & Beach Boys On Next Album!? Prepare Yourself For Eargasms!". PerezHilton.com. 2013-04-26. Retrieved 2013-06-16. ↑ "Frank Ocean 'Like 10, 11 Songs' Into New Album". Rolling Stone. 2013-02-20. Retrieved 2013-06-16. ↑ "Frank Ocean + The Clash + Diplo - Hero". indieshuffle.com. Retrieved 2014-03-12. ↑ "Memrise by Frank Ocean". dindindara. ↑ Andrew Hampp (September 15, 2014). "Frank Ocean Signs to New Management With Three Six Zero". Billboard. ↑ Guardian music. "Listen to Frank Ocean's new track Memrise". The Guardian. ↑ "Boysdontcry.co". Boysdontcry.co. Retrieved 2016-08-25. ↑ Sam Byford. "Frank Ocean's next album is coming in July". The Verge. Vox Media. ↑ "Frank Ocean Announces New Record". Pitchfork. ↑ Guardian music. "New Frank Ocean album due in July". the Guardian. ↑ Dee lockett, "What We Learned From Kanye West's The Life of Pablo Debut", Vulture, February 11, 2016. ↑ Rich McCormick, "Kanye West updates The Life of Pablo for the second time",The Verge, March 15, 2016. 1 2 3 Smith, Trevor (July 2, 2016). "Frank Ocean throws hint of upcoming sophomore album". Hotnewhiphop. Retrieved 2 July 2016. ↑ "Pigeonsandplanes.com". Pigeonsandplanes.com. 2016-08-16. Retrieved 2016-08-25. ↑ Schwartz, Danny. "The full version of endless is 140 hours long". Hotnewhiphop.com. Retrieved 2016-08-25. ↑ Ben Sisario and Joe Coscarelli, "Frank Ocean’s Long-Awaited ‘Boys Don’t Cry’ Is Due on Friday", New York Times, August 1, 2016. ↑ Ryan Reed, "Frank Ocean to Release New Album 'Boys Don't Cry' This Week", Rolling Stone, August 1, 2016. ↑ mtv (2016-08-16). "MTV". MTV. Retrieved 2016-08-25. ↑ Legaspi, Althea (2016-08-19). "Rolling Stone". Rolling Stone. Retrieved 2016-08-25. ↑ Caramanica, Jon (November 15, 2016). "Frank Ocean Is Finally Free, Mystery Intact". The New York Times. Retrieved November 16, 2016. 1 2 3 Hogan, Marc (January 30, 2012). "Hear Frank Ocean's Odd, Brief R&B Slow Jam 'Voodoo'". Spin. New York: Spin Media. Retrieved July 31, 2012. 1 2 3 4 5 6 Pareles, Jon (July 28, 2012). "Introspection Celebrated in a Crowd". The New York Times. New York: The New York Times Company. p. C1. Retrieved July 28, 2012. ↑ Lipshutz, Jason (July 6, 2012). "Frank Ocean Releases 'Sweet Life' Song, Announces 'Fallon' TV Debut". Billboard. Prometheus Global Media. Retrieved July 27, 2012. ↑ Christgau, Robert (July 20, 2012). "Frank Ocean/Greenberger Greenberg Cebar". MSN Music. Microsoft. Retrieved July 20, 2012. ↑ Kellman, Andy. "Nostalgia, Ultra – Frank Ocean". Allmusic. Rovi Corporation. Retrieved July 28, 2012. ↑ "NME Track Reviews – Frank Ocean – 'Voodoo'". NME. IPC Media. February 3, 2012. Retrieved July 28, 2012. ↑ Ocean, Frank (January 2012). "darker times they're telling boulder heavy lies ...". Tumblr. Retrieved July 31, 2012. ↑ "For The Ladies: R. Kelly, Teddy Pendergrass And The State Of R And B". NPR. October 18, 2012. Retrieved October 24, 2012. ↑ Ocean, Frank (March 16, 2011). "i am a baritone, with teno ...". Twitter. Retrieved July 28, 2012. ↑ Rosen, Jody (July 13, 2012). "Channel Orange". Rolling Stone. Jann Wenner. Retrieved July 13, 2012. ↑ Richards, Chris (July 24, 2012). "Frank Ocean at the 9:30 Club: Contemplative, confident, rewarding". The Washington Post. Washington, D.C.: The Washington Post Company. Retrieved July 27, 2012. ↑ Kohn, Daniel (July 18, 2012). "Frank Ocean – The Wiltern – 7/17/12". OC Weekly. Costa Mesa: Village Voice Media. Retrieved July 27, 2012. ↑ Goble, Corban (July 27, 2012). "Frank Ocean @ Terminal 5, NYC 7/26/12". Stereogum. Buzz Media. Retrieved July 27, 2012. ↑ Fitzmaurice, Larry. "Frank Ocean Legally Changed His Name to Frank Ocean". The Fader. The Fader, Inc. Retrieved 23 April 2015. ↑ "Frank Ocean Interview: Happy To Wake Up Without 'This Freakin' Boulder On My Chest'". Instinct Magazine. July 21, 2012. Retrieved August 19, 2012. 1 2 Frank Ocean (July 4, 2012). "thank you's". Tumblr. archived here. ↑ Nicholson, Rebecca (July 20, 2012). "Frank Ocean: the most talked-about man in music". The Guardian. London. Retrieved August 19, 2012. ↑ "Frank Ocean Opens Up About Sexuality" Billboard Magazine. July 4, 2012, archived here. ↑ Sepinwall, Alan (2012-07-09). "Beyonce, Jay-Z support Frank Ocean in open letters; singer drops Sweet Life". Hitfix.com. Retrieved 2014-07-14. ↑ Carter Maness (July 9, 2012). "Beyonce Applauds Frank Ocean for Coming Out". MTV. Retrieved July 10, 2012. ↑ Frank Ocean's Sexual Declaration: Will It Spark Change In Hip-Hop Community? MTV. July 12, 2012,. ↑ Chen, Joyce. "R&B Singer Frank Ocean Comes Out". NY Daily News, Sexual Orientation Collection. New York: NYDailyNews.com. Retrieved July 13, 2012. ↑ Russell Simmons (July 4, 2012). "The Courage of Frank Ocean Just Changed The Game!". Global Grind. Archived from the original on December 5, 2015. ↑ Garcia, Courtney. "Did R&B singer steal entire melody of 'Hotel California'?". Entertainment.msnbc.msn.com. Retrieved February 17, 2013. ↑ "Frank Ocean Debuts New Song At Coachella & Performs "American Wedding" (VIDEOS)". Globalgrind.com. April 23, 2012. Retrieved February 17, 2013. ↑ Richards, Chris (July 24, 2012). "Frank Ocean at the 9:30 Club: Contemplative, confident, rewarding". The Washington Post. Washington, D.C. Archived from the original on September 14, 2012. Retrieved July 27, 2012. ↑ Horowitz, Steven J. (January 3, 2013). "Frank Ocean Busted For Marijuana Possession & Speeding, Driver's License Confiscated". HipHop DX. Retrieved February 11, 2013. ↑ "Frank Ocean Diss Chris Brown". Complex. 2013-08-15. Retrieved 2014-02-23. ↑ "Frank Ocean Sued He Didn't Want Chipotle Logo in Chipotle Ad". TMZ. March 7, 2014. Retrieved March 8, 2014. ↑ Harris, Jenn (March 11, 2014). "Frank Ocean sends a major dis to Chipotle". Los Angeles Times. Retrieved October 2, 2014. ↑ Newman, Jason. "Frank Ocean Settles Chipotle Lawsuit". Rolling Stone. ↑ Whitehill, Gaby. "Fiona Apple claims Frank Ocean was due to sing Chipotle TV advert | Gigwise". gigwise.com. Wilson, Elliott (July 16, 2012). "Success Is Certain". RESPECT. New York. Archived from the original on September 13, 2012. Retrieved July 23, 2012. Wikimedia Commons has media related to Frank Ocean.